The Gentleman’s Magazine of September, 1773 has a 3+ page obituary of the famed British abolitionist, William Wilberforce. If you are not familiar with this early 18th century member of the British Parliament, you may want to settle in with family and friends and watch the acclaimed movie, Amazing Grace. 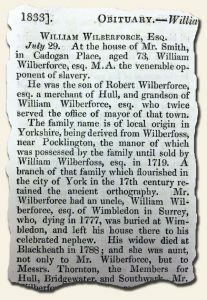 However, as a primer, feel free to read the complete obituary at: William Wilberforce Death Report. Ironically, you’ll need to scroll past much on the India slave trade in order to view the obituary. Speaking of irony… The date of his death is sandwiched between the Slavery Abolition Act of 1833’s passage in the House of Commons on July 26, 1833 and its Royal Assent a month later (on August 28th). Whereas the entire obituary can be read through the link above, as of the date of this post, it is also available as an eBay auction at: Wilberforce’s Obit (on eBay).